Human rights activist Babu Gogineni has been evicted from Nani's show Bigg Boss Telugu 2 on Sunday, while Tanish, Ganesh and Deepthi remained. Babu dropped the big bomb on Roll Rida. Six contestants were nominated for the elimination from Bigg Boss Telugu 2 in the ninth week and Nani made two contestants safe in the Saturday episode. On Sunday, the host announced that Tanish, Ganesh and Deepthi were safe from the eviction and he asked Babu Gogineni to pack his bag and come on the stage. Later, Babu Gogineni appeard with Nani on the stage of Bigg Boss Telugu 2. Addressed the inmates, he gave advices to couple of the housemates. He dropped the big bomb on Roll Rida. The rule of the bomb is that Roll has to clean the bothroom for the next one week. 10.35 pm: Babu Gogineni gives a good message to Samrat and Deepti Sunaina and leaves the show on a friendly note. He mentions that it was a lifetime experience for him. He drops the Bigg bomb on Roll Rida, before leaving from Bigg Boss Telugu 2. Even Nandini Rai had dropped the Bigg Bomb on Roll in the previous week. 10.20 pm: Babu Gogineni joins Nani on the stage. He is shown AV featuring his Bigg Boss Telugu 2 journey. Nani starts a conversation with him and asks him to share his experience in Bigg Boss Telugu 2 house. He thanks the makers of the show and Nani for the opportunity. Focus shifts to Na-nee tv and Babu talks to the housemates and he tries to create fun with his ex-housemates. 10.15 pm: Deepthi, Ganesh, and Tanish thank the audience for keeping them in the protected zone. Babu Gogineni bids a bye to the Bigg Boss Telugu 2 contestants. Most of the members are seen feeling sad, as they consider him as one of the respected persons. A group selfie is taken, Babu promises that he would send them books and stuff after they go out. 10.15 pm: It is time to reveal the name of the contestant who is to leave the Bigg Boss Telugu 2 show today. Nani reveals that Tanish, Deepthi, and Ganesh are into the protected zone escaping the eliminations. Nani requests Babu Gogineni to pack his bags and join him on the dais, as he is the one who got eliminated from Bigg Boss Telugu 2. 10.03 pm: Nani draws the caricatures depicting the contestants. Both the contestants and Nani are seen having a good time, and they are shown enjoying the show thoroughly. Nani makes witty comments on Tanish and Amit. Nani mentions that the entertainment has ended now. He says he would announce the results of Bigg Boss Telugu 2 eliminations. 10.00 pm: Babu Gogineni draws a caricature and Roll Rida makes a right guess easily. His next caricature is guessed by his team in no time too. Singer Geetha Madhuri gets her turn to draw the caricature. Shyamala takes no time to guess the right answer. He next caricature caricature earns another point to her team, as they guess it rightly. 9.56 pm: Deepthi's turn comes up, she draws a caricature and her team makes a right guess in no time. Both the team get one point each, as they both give a right answer. Nani draws the caricature of Geetha Madhuri next. 9.50 pm: It is Amit's turn to draw the caricatures. As Amit is not confident of the option he has got to draw on the whiteboard. Pooja Ramachandran helps him out, by drawing the caricature, but fails. Kaushal makes a right guess of Amit's next caricature. 9.41 pm: Shyamala gets her turn to draw the caricature. Her team makes a right guess. Shyamala's next caricature is guessed by Geetha Madhuri correctly. Nani creates so much fun by drawing the caricature of Roll Rida. 9.38 pm: Ganesh starts drawing the caricatures, and Shyamala guesses it right again. In the next guess, Geetha answers with a right answer. Nani starts drawing the picture of Deepthi Sunaina, and everyone burst out with laughter. Samrat gets his turn to draw the caricature next. He is seen being doubtful before he draws another caricature. Tanish makes a right guess. 9.35 pm: Nani draws a caricature depicting Pooja Ramachandran. Nani enacts Pooja and it turns out to be a fun show. Roll Rida's turn next. He draws a caricature which implies the meaning of a Telugu proverb. Shyamala guesses it rightly. So, her team is in the lead now. 9.29 pm: Nuthan Naidu draws a caricature and the housemates guess it all correctly. It turns out to be very entertaining when the Bigg Boss Telugu 2 start guessing the next caricature with irrelevant names. Nani is seen enjoying the show thoroughly. 9.20 pm: Nani also participates in the game and draws a caricature. 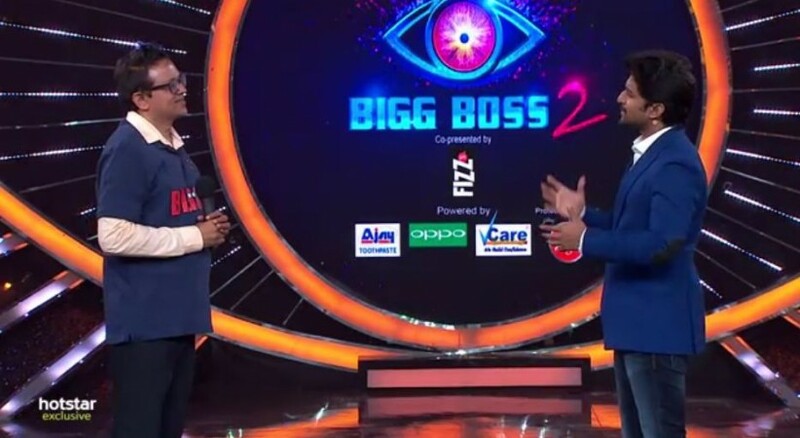 He asks the contestants to guess who among the Bigg Boss Telugu housemate is the picture depicting. Next comes Kaushal's turn to draw the caricatures. Roll Rida guesses it right. And he draws another picture, which is guessed by Ganesh rightly. Kaushal's caricatures are funny. 9.15 pm: Deepthi Sunaina starts drawing the caricature on the whiteboard. Shyamala guesses the proverb rightly. The other caricature is guessed by Shyamala again. The whole environment turns out to be a fun task, as Nani passes witty comments. 9.10 pm: Nani then asks the team members to get divided into two groups for a fun task. Pooja is an exemption, as she is not yet fluent in Telugu. The game is all about guessing the local proverbs, which is drawn by each contestant on the whiteboard. The game begins with Tanish drawing a caricature and the other teammates start guessing, Babu Gogineni tells the right answer. 9.05 pm: Nani meets the Bigg Boss Telugu contestants via Na-nee tv. He begins his conversation with the house members. He gives a toast to all the members who are prepped up in special attires. 9.00 pm: Nani enters the Bigg Boss Telugu 2 show with a performance for a breezy song. As usual, he begins the story with a moral-based short story. 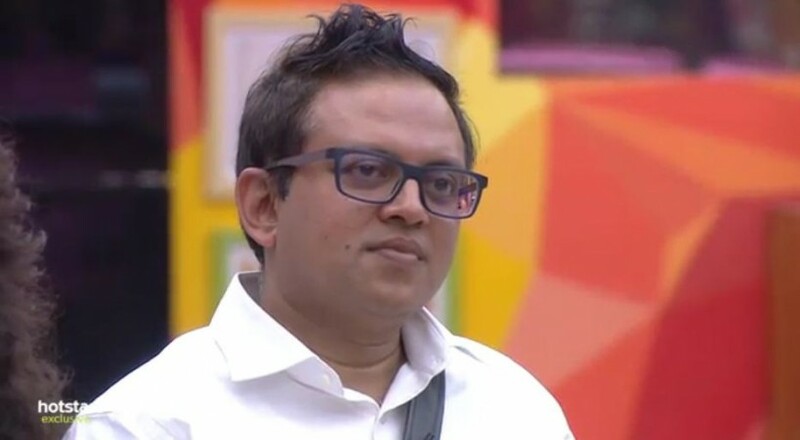 The buzz in the media claims that human rights activist Babu Gogineni has been evicted from the house of Nani's Bigg Boss Telugu 2 in the ninth week. Tanish, Ganesh and Deepthi are currently safe. Babu Gogineni, Tanish, Shyamala, Geetha Madhuri, Ganesh and Deepthi were nominated for the elimination from Bigg Boss Telugu 2 in the ninth week. Nani announced on Saturday that Shyamala and Geetha Madhuri are safe from the eviction. Four housemates are in the danger zone and one of them will be shown the door in the Sunday episode. IBTimes India conducted a survey to predict who among the six nominated contestants should be eliminated from Bigg Boss Telugu 2 house this week. 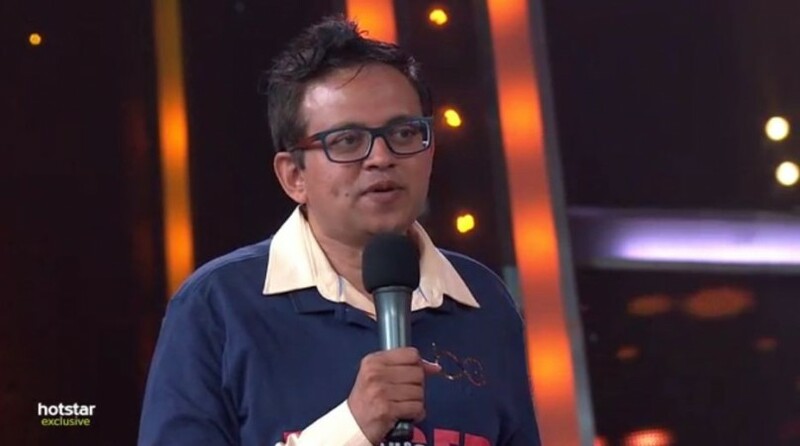 The results show that 32.13 percent of the viewers want to send Babu Gogineni out of the house, while five other housemates got less than 20 percent vote each in our poll. But if we are to go by the leaked reports, Babu Gogineni has already been evicted from Bigg Boss Telugu 2 and this news is creating a lot of buzz in the social media. Some viewers are upset with this rumour and saying that they will stop watching the show if this turns out to be true. Many people are apparently happy with the news about Babu Gogineni's elimination from Bigg Boss Telugu 2. They say that he is a fake humanist and he has jealousy and hatred towards other inmates. His stint on the show has exposed his real-side. Here are some comments posted on Twitter after the news about his eviction broke out.